Need some inspiration to get you past Hump Day? 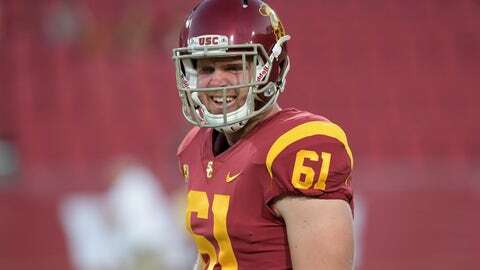 Jake Olson, a USC long snapper who lost his eyesight to retinoblastoma, participated in the Trojans’ Pro Day Wednesday in an effort to raise money and awareness for those affected by the disease. What happened next was absolutely jaw dropping. Olson, who joined the Trojan family as a kid in the Pete Carroll era, benched 17 reps at 225 pounds in front of a raucous crowd. You can help contribute to Olson’s cause by clicking here.